The humanitarian principles are an essential tool for achieving effective humanitarian policy and operations for crisis-affected people. VOICE works to ensure the policies, practices and funding of EU and member state institutions relevant to humanitarian aid increasingly follow core humanitarian principles and good practice. Therefore VOICE promotes the European Consensus on Humanitarian Aid and its implementation and advocates, for instance, for clear roles and mandates for the various actors involved in crisis and disaster response. Humanitarian NGOs represent the solidarity of the European public with crisis-affected people around the world. VOICE works to increase the recognition of NGOs as key actors in the delivery of humanitarian aid and showcase their added value. Often, NGOs are the best equipped to respond to crises in the field due to their expertise and experience. NGO work provides added value, for instance by being able to help hard to reach populations. VOICE brings its NGO members together to share their knowledge and expertise and use it to shape relevant policy development. VOICE’s membership brings together policy and field expertise. VOICE builds common NGO positions through information sharing and gathering members in thematic working groups. The resulting positions are used to influence policy of EU institutions and Member States, including on funding and operational practice. Successful examples include the on-going work of the From DRR to Resilience Working Group and VOICE’s work across 18 EU member states to secure additional funding for EU humanitarian aid in the 2014 EU budget. To improve the effectiveness of its advocacy, VOICE builds alliances with other humanitarian actors e.g. the UN and the Red Cross movement. VOICE also seeks to build bridges between humanitarian aid and development by providing expertise on Disaster Risk Reduction (DRR) and Linking Relief Rehabilitation and Development (LRRD). Position papers, studies and publications: VOICE builds common NGO positions through information sharing and collaboration in working groups. These are used to influence policy of EU institutions and Member States, including on funding and operational practice. 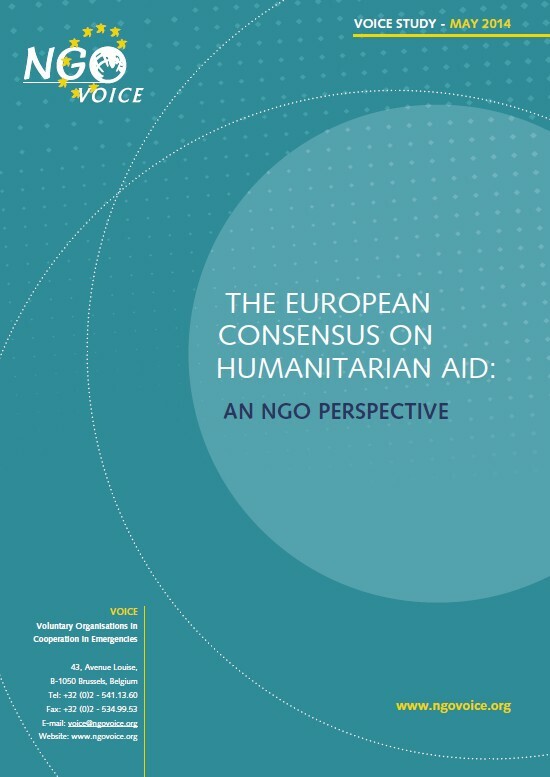 Recent highlights include NGO perceptions of the European Consensus on Humanitarian Aid (2014 – see right), EU humanitarian donors’ funding and conditions for working with NGOs (2015) or the EU’s Global Strategy on Foreign and Security Policy (2016). Since 2004, VOICE members share their expertise and work in the biannual magazine VOICE Out Loud. Events and Roundtables: VOICE organises and participates in events such as conferences, roundtables, trainings and meetings throughout Europe. Some of these are aimed at informing VOICE members about humanitarian policies and procedures, and assisting them with donor requirements (in particular of the Humanitarian Aid department of the European Commission, DG ECHO). Many of these activities aim to influence the European Institutions on humanitarian issues. Dialogue and Partnership: VOICE plays a key role in facilitating the dialogue and partnership between NGOs and the European Commission on humanitarian aid, including through the FPA Watch Group and its predecessors: one of the oldest official groups for NGO dialogue with the EU. Quality and accountability initiatives VOICE commits to! During the past decades, the humanitarian sector has developed and improved a number of voluntary quality and accountability initiatives through standards, guidelines, and indicators to reinforce technical quality and accountability of humanitarian operations. VOICE members are strongly committed to international quality and accountability initiatives when responding to humanitarian crises for a more sustainable impact on the lives of affected populations and towards its implementing partners and staff. They have been at the forefront of developing, supporting and integrating quality initiatives into their humanitarian work. VOICE as a network aims to support members’ access to tools, information, and resources related to developing quality assurance systems relevant to their humanitarian work. VOICE members’ concern with the quality of humanitarian aid underpins the network’s objective of principled humanitarian action. VOICE Members are traditionally committed to The SPHERE standards, 40 VOICE members hold a membership with the Core Humanitarian Standard Alliance, 12 VOICE members are certified against Core Humanitarian Standard. VOICE currently has two working groups and one task force. The Framework Partnership Agreement (FPA) defines the contractual relationship - regulations and responsibilities - between DG for Humanitarian Aid (ECHO) and humanitarian organisations. The FPA Watch Group represents the views of ECHO NGO partners in the monitoring, review and consultation of all matters relating to the FPA. The VOICE “From DRR to Resilience” Working Group was established in January 2018, building upon the achievements and expanding the mandate of the DRR Working Group, established in March 2007. The DRR Working Group established itself as the main reference point for EU Institutions with NGOs on DRR policy and practice, and the new group seeks to expand this influence to the increasingly prominent resilience and nexus agendas. The group's overarching goal is to contribute to and improve EU policy and practice on Disaster Risk Reduction (both as member states and European level), as well as to provide the NGO perspective for the European approach to resilience and the implementation of the humanitarian-development nexus. The VOICE network has decided to create a task force to work on the Grand Bargain. Its work began in November 2016. In 2017, VOICE will focus on the implementation of the Grand Bargain at EU level. Through the Task Force, the network will offer a forum for its members to engage in the EU delivery of the Grand Bargain and jointly advocate for its potential benefits to have a direct and positive impact in the field. Grand Bargain Workshop: Risk Sharing to reach the ‘Grand’ Bargain? VOICE Event: Do no harm and conflict sensitivity: two sides of the same coin? Breakfast Briefing - The humanitarian consequences of the bombing and shelling of populated areas and the way forward to protect civilians from this harm.